On May 10, 2012 the automotive industry lost one of its true giants when Carroll Shelby passed away in Texas at age 89. 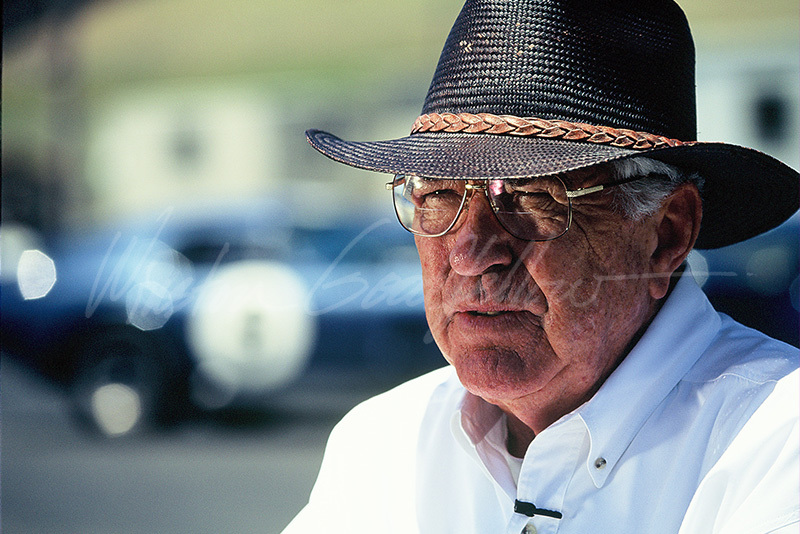 One of my favorite shots of Carroll, taken in 1995, with a Shelby Cobra Daytona Coupe is in the background. The Daytona Coupe won the world championship in 1965. I was extremely fortunate to have gotten to know Carroll over the past decade-plus, and though he didn’t like Enzo Ferrari at all, in many ways their careers were similar in that each man basically reinvented himself at a later stage in life. Carroll was nearly 40 when he began producing the Cobra, and Ferrari nearly 50 when he started making the cars against which Shelby would compete and win on many occasions. Both men were master motivators, though I preferred Carroll’s style. Ferrari had no problem pitting his troops against each other to extract the most out of them, while Shelby basically gave you enough rope to either tie the most beautiful knot or hang yourself. I experienced that “rope” in an offhand way when putting together the Shelby Mustang display for The Quail in 2010. I called and told him the event was going to take place but did not extend an invitation, for Carroll was the type of person who liked to do things on his terms. I figured he’d come on board if and when he was ready. That’s when the “rope” realization hit. I called Pete Brock to confirm the observation, and he agreed. (Pete worked with Carroll from 1962-1966, his most famous contributions being designing the world champion Cobra Daytona Coupes and the now iconic cosmetics and stripe package for the GT350). One great thing about Carroll was he would normally pick up his mobile phone rather than have “people” do it for him. It didn’t matter if he was in a meeting, a doctor’s office or the hospital, he would talk if he could. The last time we spoke we were trying to get together to cover his time in Modena in the mid-1950s, and the 1970s when he was in Africa. Unfortunately that opportunity never came, for his health declined in the last year of his life. Throughout it all, Carroll’s mind remained incredibly active. Most everyone at Shelby American in Las Vegas talked about how Carroll would challenge them on a weekly basis, coming up with some new idea that he hoped would see the light of day. Carroll Shelby was one of the most fascinating individuals I’ve met, and fortunately for all of us his legacy lives on at Shelby American. If you would like to read a bit more on Carroll and Shelby American, check out the end of this blog entry.